Are you sick of packing a suitcase full of toys for a quick holiday trip? Unsure of how you could possibly go on a holiday with kids without packing a single toy? 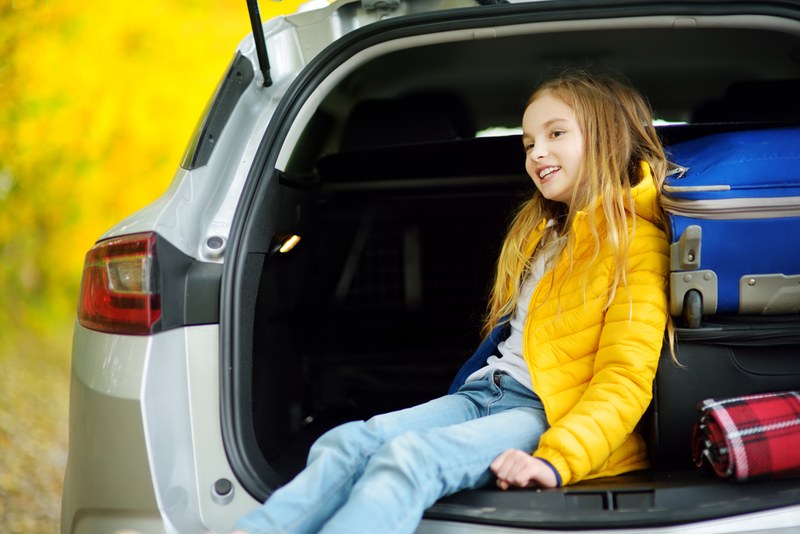 Here are some easy practical play ideas to do on holidays with kids that won’t take up any room in your boot at all! 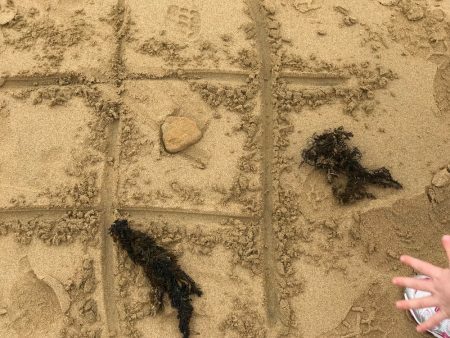 Beach, forest, country, snow… whatever the destination, use the materials on hand to create a noughts and crosses game with a difference! Even better, the act of collecting items is an adventure in itself! 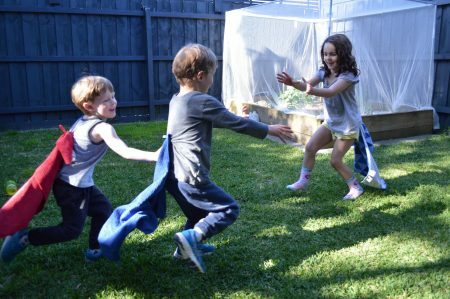 Simply peg a tea towel (or, if in a hotel room, hand towel or face washer) to the bottom of each child’s t-shirt (or tuck it in their pants) and let them chase each other around trying to steal each other’s tail. Find a container, some tongs (or tweezers or even chopsticks for older kids) and some cotton wool balls and let them practice their fine motor skills by sorting them into and out of the tray. If you do not have cotton wool balls on the holiday, simply find other items that can be picked up by tongs; such as socks, pegs or complimentary soaps. Put 5 objects on the floor and ask your child to memorise them. Cover the objects with a blanket and take one object away whilst the child’s eyes are closed. Uncover and test your child’s memory on which item is missing. Think everyday items to find. You can draw a picture of each item to find or alternatively, why not do a nature scavenger hunt and get the kids to find items in the world around them. Simply roll up a couple of socks, find some buckets or mixing bowls (or even suitcases), and let the kids have a shoot-out. As soon as they get it in the bucket, take a step back and try again. For bigger kids, you can even try using cups. 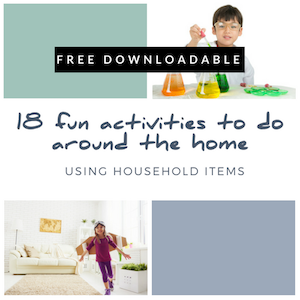 And if you are looking for a few more entertaining ideas to keep the kids entertained for free whilst on holiday (or at home), then be sure to download our guide: 18 fun activities to do around the home using household items. 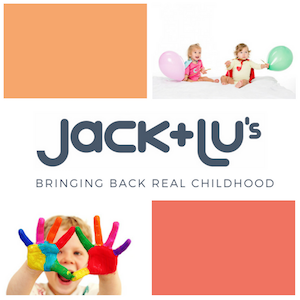 Alice is the founder of Jack and Lu’s: a company created with a simple dream of bringing back real childhood; where the toys were simpler, the items were fewer and the imaginations were greater. 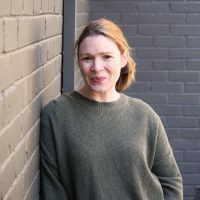 With the birth of her second child and a renewed need to be at home whilst caring for a baby, Alice quickly became frustrated with the lack of books that encouraged play at home for her eldest without too much focus on crafts, huge setup times or a large investment in materials. Sick of the Mumma’s guilt that goes with not being able to sit in a park all day and even more sick of a cluttered house, full of large, cheap, noisy toys that were never played with, Alice sought about writing the book herself. 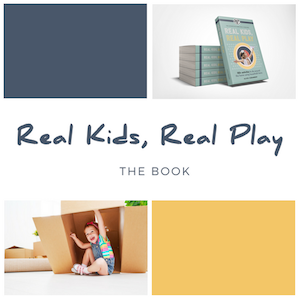 In early 2018 her new book “Real Kids, Real Play” was released which details 150+ activities to do around the home using household items. It is her hope that it can help make every parent, guardian, grandparent’s and carer’s role just that little bit easier.